As a reminder for the wonderful trip we have coming up for Brasil we have posted a short video from our trip last May. After the Auction and before the Expo we hold a three-day intensive clinic at Manege Sant Adelaide, home to our friend Davi Carrano. Have a look on the “BRASIL TRIP DETAIL” page here on the blog for an itinerary. If that isn’t enough excitement, how about this: There are SEVEN, yes SEVEN horses from Brasil arriving here beginning tonight. I’ll be posting images and descriptions beginning tomorrow. 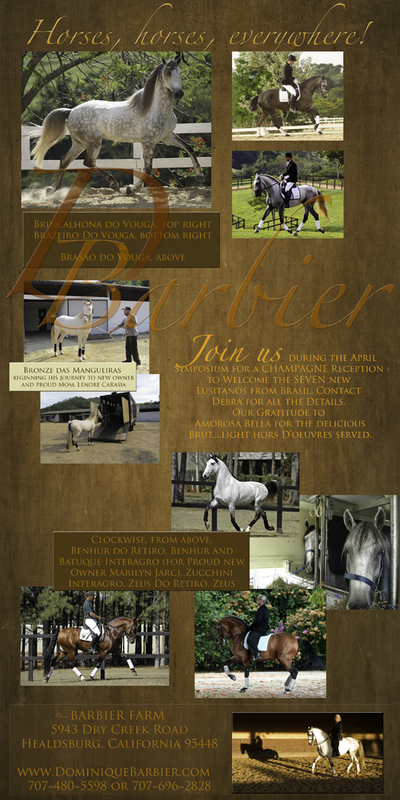 During the APRIL SYMPOSIUM we will introduce “The Magnificent Seven” during a champagne reception on Saturday evening. All the registered attendees are invited….it’s not too late to sign up! Call Debra ~ 707-696-2828. Amorosa Bella Wines has generously supplied their Amorosa Bella Sparkling Brut and we’ll have light hors d’oeuvres while the Seven are being introduced. They won’t last long, people are already slated to visit beginning next week for a sneak preview.